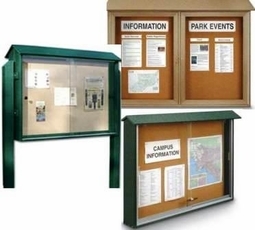 Outdoor message centers are the perfect weather resistant locking cabinets for parks, ball fields, trail heads, pool areas, college campuses, campgrounds and more. 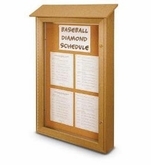 Locking weather resistant cabinets keep your posters and notices safe and undisturbed from nature's worst heat, snow and rain. 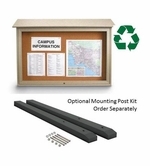 Locking outdoor message centers that are made with natural looking materials that are actually made from recycled plastic bottles. 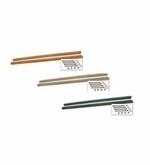 They're better than wood because they're mold and moisture resistant so they'll last much longer. 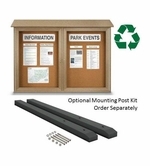 Available as free-standing units with lawn post or mount to buildings, post or fences. 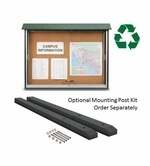 Select from single sided or double sided, free standing or lawn mounted units.